"It's not my fault that Buttle's heart condition didn't appear on Tuttle's file!" Terry Gilliam's dark fantasy/satire Brazil has one of the most troubled histories of any picture that actually made it to the screen, with studio interference sabotaging Gilliam at every turn, to the point he had to take out full page ads asking Universal to release his movie. The story made for one of the great DVD sets of all time, Criterion's three-disc extravaganza with multiple versions of the picture. The one shortcoming that the set had was that the final cut was presented in nonanamorphic widescreen. As part of their program of revisiting earlier releases, Criterion is re-releasing the box with a new anamorphic transfer on the final cut version, and for those not caring to invest in the entire set again, it's also now available as a single disc, which is under review here. Set somewhere in the 20th century, this grim classic centers on bureaucrat Sam Lowry (Jonathan Pryce), who putters away in the records department of the information ministry, spending his off hours in a fantasy world, dreaming of a blonde princess and of himself as a winged warrior. A computer glitch (caused by an actual bug falling into the works) sends the ministry's police force after Harry Buttle (Brian Miller), instead of freelance heating engineer Harry Tuttle (Robert De Niro), wanted for unauthorized HVAC repairs. When neighbor Jill Lamont (Kim Greist) tries to protest Buttle's abduction and torture, she catches the eye of Sam, who recognizes her as his dream girl. Using a promotion to Information Retrieval (courtesy of his plastic-surgery-addicted mother Ida, played by Katherine Helmond) to try to locate Jill and bring his fantasies to reality, Sam eventually gets himself into deep trouble as he tries to thwart the system. But a society that appreciates order above all else has little room for flights of fantasy, and even if he can convince Jill of his sincerity there may not be a future for them. Where to begin with a picture that is so full of detail and layered in many different ways, thanks to Gilliam's unique visual sense and the writing skills of Tom Stoppard, who contributed substantially to the screenplay. The visuals are insistently stunning, both in the fantasy sequences and the story's corporeal setting. Although Gilliam notes much of the picture is done with model work, very little of it is distinguishable from the full-scale sets and locations used, making for a seamlessly unique world. Starting with Sam's winged armor, to the monoliths hurtling out of the earth, to the amniotic sac of the Dream Girl, to the gigantic samurai built out of computer parts, Gilliam's visuals take the viewer along on the flight of fancy that Sam Lowry uses to escape his grim world. But that world has a visual flair of its own, starting with the omnipresent ductwork and Sam's tiny Messerschmitt car. The ghastly series of complications that afflict Ida's friend Mrs. Terrain (Barbara Hicks) are both appalling and hilarious, climaxing in an unforgettably messy sequence. The Ministry of Information's design is openly fascist, with heroic-sized statuary, the weird baby-faced mask Sam's friend Jack Lint (Michael Palin) wears as he coolly tortures suspects to retrieve information, and impossibly high counters at which the public must try to appeal to the heartless bureaucrats atop them. What makes this a truly fascinating film, though, is the characterization of Sam. True to Hannah Arendt's notion of the banality of evil, Sam and his cohorts are just doing their jobs, confident that they're doing the proper thing so long as the paperwork is completed. But when he must provide a refund to Mrs. Buttle (Sheila Reid) for the charge made to her husband's account for his erroneous torture, the impact that his paper-shuffling has on ordinary people suddenly comes to his consciousness. After he meets Jill, his growth continues: after a hair's-breadth escape that leaves him feeling exhilirated, as if he has lived through a movie chase scene, he is horrified to see one of his pursuers stumble out, perishing terribly in flames. Only after he begins to develop an empathy can his feelings for Jill move beyond a fantasy adoration to an honest love that might have some sort of future in a better world. The political satire is quite sharp, depicting a Big Brother world (though Gilliam describes the film as a documentary) that is obsessed with injecting fear into the populace. The chosen threat is terrorism, although the government doesn't seem terribly interested in eliminating the threat. One official (Peter Vaughan) dismisses the 13-year run of terrorism as "beginner's luck." Torture is well into the mainstream, reduced to another form of Information Retrieval, for which the government sends the victim the bill. At the same time, the government engenders suspicion at every turn, to the point that Sam even suspects Jill of being a bomb-carrying terrorist herself. Few depictions of office life are quite as warped as the sequences of Sam in his tiny new office, sharing a desk through a wall as a pneumatic tube spews inconsequential messages at him. The paper-shuffling incompetence of the service industry gets a major skewering in the persons of Spoor (Bob Hoskins) and Dowser (Derrick O'Connor), a pair of vindictive repairmen who turn Sam's apartment into a living hell. But while the film is packed full of ideas, it moves relentlessly along, so that the lengthy running time hurries by. Although the score is credited to Michael Kamen, musical coordinator Ray Cooper gets a lot of credit for the many permutations to the title song. It's constantly reappearing in various forms as cheerily optimistic, darkly ominous, heroically triumphant and downright nightmarish, as the case may be. It gives the film an off-kilter unity and emphasizes the darkness inherent in the supposedly carefree, a metaphor for Sam's own existence. 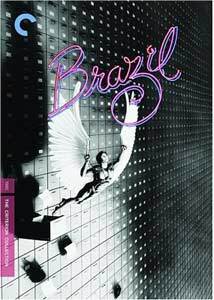 It's alternately thrilling, comic and horrifying, and encapsulates the world of Brazil in bravura fashion. It's the perfect topping for a marvelous film. Image Transfer Review: The main attraction here is the new transfer, which doesn't disappoint. Although the original was one of the better nonanamorphic transfers out there, the anamorphic version, which sports additional cleanup, beats it hands down. Detail and textures are excellent and blacks are rich and deep. The German-Expressionist-influenced cinematography with intense contrasts of blacks and whites benefits greatly from the improvement. Where the rather grey color palette dips into other area, the color is quite vivid and striking. The film stock used has a fair amount of heavy grain, but it is rendered well, with minimal sparkling. Audio Transfer Review: The audio seems to be the same Dolby Surround version as the original. It's quite clean, and the score sounds terrific throughout. Dialogue is generally clear, though at times the mix intentionally intrudes upon it. The explosions have reasonably good presence but low bass is lacking. Extras Review: On the single-disc release, the sole extra is the Terry Gilliam commentary, ported over from the original 1996 laserdisc release. Gilliam is always an insightful commentator, and he has a great deal to offer on this picture. It's one of the models in the field, and there are virtually no dead spots. A short booklet with an essay by Jack Matthews, author of The Battle of Brazil, is included in the case. The boxed-set version retains all of the many extras that were found in the original set, should you have somehow managed not to acquire that. The grade is for the single-disc version; the box continues to get a solid A. One of the best films of the 1980s, if not ever, marvelous on so many levels, finally gets a proper anamorphic release. I don't throw the word "masterpiece" around lightly, but no other word suffices to describe Gilliam's thoroughly amazing and twisted vision. My highest recommendation.